Wife wants a new ride. Either an Acura RDX 2014 or newer or an Audi Q5 2014 or newer. Guy who works on my cars (Honda tech for 30+ years) says take the Acura. However, almost every magazine or website I look at says Audis are reliable, etc. Thoughts? I have a 2012 Q5 3.2 Prestige. I am the second owner. I've owned it for about a year an a half and I've had a few repairs done. It currently has 50,000 miles on it. The power mirrors were making noise so had to have those replaced. There was an awful noise coming from the trunk cover moving around so they had to go in and felt the body. The noise disappeared. To have the bigger engine I have been very happy with the gas milege. I get 18-20 mpg in the city. I was getting alot less in my VW Tiguan. My only major complaint is the MMI system. It acts up alot and they have replaced it once already. Sometimes it won't tell me the song info, the music (satellite radio)cuts in and out way more then other car I have owned, and every now and then I'll get in the car and start it up and music/static will blast out of one of the back speakers. I can turn the car off and leave it parked for a little while and try again and it'll be normal again. The system appears old and outdated...and although the newer Audi systems look a little better then minethey are still behind other cars I think. With all of that being said I still love the car and don't regret my purchase. I'm going to go get a used 2018 as soon as more of them start hitting the market. I have had the following Audis: 2007 Q7, after 100,000 miles I incurred heavy maintenance costs, managed to get good value in a trade for a used 2012 Q7, almost 2 years old with about 19,000 miles. I kept it until it hit 45,000 miles, was problem free until they had to replace the panoramic roof (under warranty--no cost). The roof never leaked but developed an annoying yet hardly noticeable noise. I traded it for a new 2016 Q5, which now has 22,000 miles. It was problem free until very recently they had to replace one fuel injector. Not sure what caused that, but it was covered under warranty. I was able to keep driving it but this instance made me think again I do not want to be without warranty coverage. I really like the Audi's, would like to keep my current Q5 for a few years but will probably sell or trade it just before the warranty runs out. You really get spoiled. 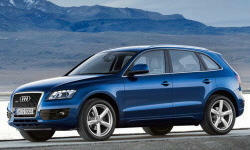 If you opt for a used Q5, I suggest buying a certified with the additional warranty. I did evaluate an Acura before buying my first Audi. I prefer the drivability and interior and exterior of the Audi but would bet the Acura is more reliable. Hondas are boring but they run, largely problem free. Acura's should be similar. I must say, we have always loved our Audi's. Good luck. Btw, big fan of Wisconsin! For the price of a 2016 Q5 at almost $40,000, which is an old platform due to be replaced in 2018 along with the Acra RDX, you might want to look at a used 2016 Buick Envision Premium l or ll. Used executive driven Prem ll can be mid $30's with a few thousand miles. Our 2016 Envision Prem ll with panoroof and Drivers Confidence, which includes surround cameras, self parking, adaptive cruise,( including slow speed braking to a stop) Lane Keep Assist(semi autonomous driving), HUD, and auto opening tailgate to name a few was $35,000 with 3,000 miles or basically new to us. Nothing can match the options and quiet riding of the Envision for that price. We could not find any deals near us or statewide, but ending up buying one the next state over. Except for Lexus and Buick, Audi is the most reliable luxury car brand. Acura has taken a huge leap backwards in reliability. I would take the Acura though because of the lower repair costs. Besides, the main problems with the Acura have to do with the infotainment system, which isn't great. Even better, look at a 2015 Lexus NX. You can ensure excellent reliability and a comfortable ride. It's based on the RAV4, which can be misleading, but they did a great job disguising and making it am entry-level luxury car. It's not a typical old man Lexus. It's more sporty, for better or worse. The Buick Envision, according to Consumer Reports, is "underdeveloped," "overpriced," and not "fully-baked." They also mention too much wind noise, clumsy handling, and an unsettled ride. Acura is not really even luxury. Those shiny calipers have long been tarnished. The 2016 Buick Envision Premium l is about $10,000 less than the NX but doesn't offer $10,000 more...but actually offer less. The warranties are about the same except for one or two years difference on some coverage they basically the same. But you can only transfer the warranty once with the Lexus for a $25.00 fee, Buick is unlimited warranty tranfers. The free maintence schedule has coverage of all luxury makes with 1-year 10,000 miles whiles are close to double the coverage. Synthetic oil every 5,000 miles is not cheap with the Lexus. The 2016 models I compared the NX did not offer leather where the Envision did, NX does not offer tri-zone climate control where the Envision did...all those features add up to make the NX a even worse than it's price. The gas mileage worse in the NX along with longest braking distances from 60 mph in the segment. But it's not convincing, and much of that has to do with its RAV4 underpinnings. Nothing against Toyota's super-popular small SUV, but luxury is not in its DNA. The NX's looks promise derring-do performance, and its handling is indeed sharp. It's responsive compared with a typical Lexus, but handling and braking are a notch below competitors from BMW and Audi. And the NX doesn't deliver the quiet, calm, and serene ride you expect from a Lexus. Instead, it's as firm and controlled as an IRS audit. The performance doesn't match the looks -- like when a peach-fuzz sibling borrows his big brother's leather jacket, the appearance isn't quite right. Inside the cabin, the NX once again falls short of Lexus standards. You're not cosseted with parlor-room luxury. Many parts and panels look and feel cheap, costing the NX points for fit and finish." One funny note is that they both have a cd player slot! Buick holds it's value well playing the near-luxury area where Lexus models do not fare well in residuals but are on par with their luxury segments and sometimes worse in the case of the GS. Had a 2006 Audi A6 for 55,000 miles. It was bullet-proof. I can't speak for the newer ones.